This exquisite silver piece can only lead one to try to imagine it’s romantic history. The two pieces are a matched teacup and saucer, by the renowned Kutch silversmith Oomersi Mawji, and bearing his stylized coriander-leaves-and-flowers motif. Each piece is inscribed “E.B. Lover,” the cup on its side, emblazoned on a ribbon; the saucer around its center, where the cup would rest. But Oomersi Mawji, who certainly made many teapots, knew well that a hot liquid in a silver cup would render the cup handle impossible to be held in one’s fingers. It appears then that the teacup and saucer was perhaps never intended for holding tea, but that the form was rather only fanciful, perhaps meant to hold a small bouquet of flowers on a breakfast tray, or to convey some particular allusion. And what of the inscription, “E. B. Lover”? Is it simply the name of someone it was presented to as a gift? Or does “lover “ signify something else altogether? Time has its secrets. Harish K. Patel has been collecting Indian classical art for more than twenty years. His silver collection from India dates from the Raj Period, some of it made by local Indian silversmiths, some by British Colonials. The collection includes the work of Orr and Hamilton, as well as Oomersi Mawji, Dass & Dutt, and others, in the regions of Kutch, Chennai, Lucknow, Kolkata, Kashmir, and Rajasthan. 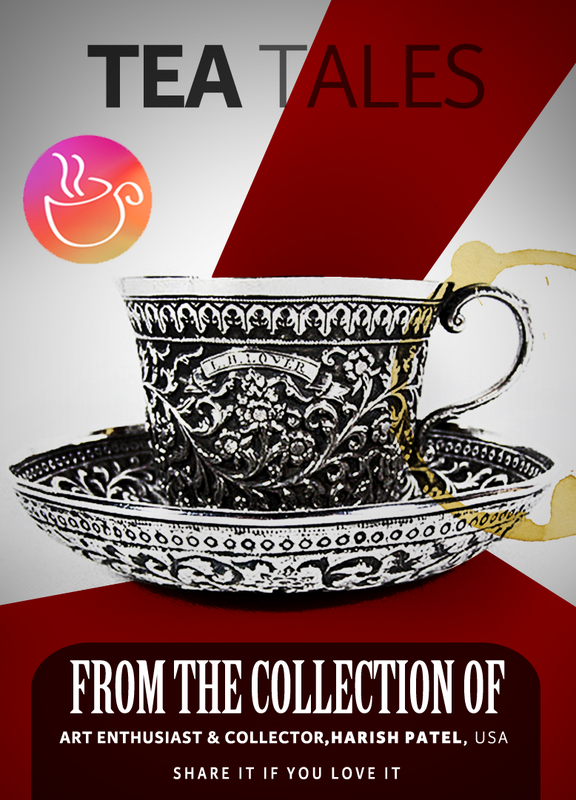 This entry was posted in Tea Art, Tea Design, Tea Tales and tagged Harish Patel, Kutch Silver Jewellery, Silver Tea Cup, tea, Tea Art Collection, Tea History. Bookmark the permalink. Archana, thank you for the appreciation. You’ve an interesting website. Gotta check it out! excellent post, very informative. I ponder why the opposite experts of this sector do not understand this. You must proceed your writing. I am sure, you have a great readers’ base already! Thank you so much for your kind words and appreciation! We aim at connecting with all tea lovers. Hopefully, with time, we’ll reach out to much wider audience. I have been exploring for a bit for any high quality articles or blog posts in this kind of space . Exploring in Yahoo I ultimately stumbled upon this web site. Studying this info So i am happy to express that I have an incredibly good uncanny feeling I came upon just what I needed. I most definitely will make certain to don?¦t forget this site and provides it a look on a continuing basis.